A small, but significant, successful business development of Thud's meant that a glass, or two, of bubbly was the order of the evening. 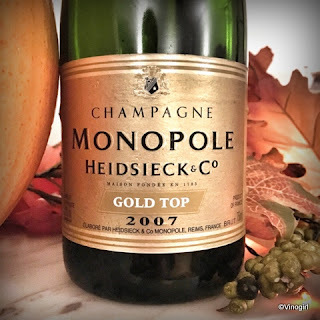 The Heidsieck, 2007 Monopole Gold Top was a delightful choice with which to celebrate. All toasty-rich, appley goodness, the Gold Top was a suitable tipple for the occasion. And that of my 1200th post. I have been busy since I got home: the Vino-nieces and Vino-nephew have been on half term from school and I have been kept on the go. I have only had one other wine in the past week. It wasn't very good, which was disappointing as I hoped it would be great. Made from the Marzemino grape, the wine definitely had plummy characteristics, but it also had a very bad case of volatile acidity. Hate when that happens. ...to where I once belonged, Part 9. Yes, I'm on my way to Blighty once again. Vinomaker and I toasted my upcoming holiday, at dinner last night, with a bottle of Bodkin, Cuvée Agincourt, Blanc de Sauvignon Blanc. Bodkin is a sparkling Sauvignon blanc; it's not the greatest of wines, it's not bad just vinous and not very complex. It may have been a little better if it hadn't seemed slightly old and a little oxidised (perhaps it was just a bad bottle). However, I thought it a fitting wine for this particular trip, for when I wake up on my first morning at home, the 25th of October, it will be St.Crispin's Day. And the 601st anniversary of the Battle of Agincourt. Hee, hee! I had forgotten all about this bottle of Lambrini that I had brought back from England with me last April. Marketed almost exclusively to women, Lambrini is a cheap, sweet, low alcohol, sparkling perry that is produced in Liverpool. A lot of good things have come out of Liverpool over the years. However, Lambrini isn't one of them. I had meant to do a blind tasting of the Lambrini with Vinomaker this summer whilst Thud was visiting, but I forgot. I thought it would have been an entertaining tasting for me and Thud to share the Lambrini with someone who had never tasted it before. Then I completely forgot all about the Lambrini again - until just yesterday when I spotted it in my wine-stash (whilst looking for a particular vintage of something altogether more serious). Time for some Lambrini-larks. Well, it wasn't much of a test for Vinomaker, as he immediately deduced that the tipple in his glass was not made from grapes. He's good. Still, I wasn't altogether disappointed in my quest for cheap entertainment at Vinomaker's expense: his face upon first tasting the perry had to be seen to be believed. He very quickly poured himself a glass of a 2015, Miner Family Viognier. The 1.75 inches of rain that fell on me last weekend (I always take it personally), when paired with five days of ample sunshine with temperatures in the mid to high 70°s, have produced a distinct green haze of sprouting grasses and weed-seedlings all over Vinoland. Like magic, opportunistic r-selection plants have taken full advantage of the combination of rain and sun and have begun the process of turning California's rolling, golden hills and the vineyard floors of the Napa Valley into velvety-verdant vistas. Then, a little time later, and after subsequent rain events, everywhere will have to be mowed. Cycles. Vinomaker and I pressed off a lot of wine this afternoon. A lot! (Two batches of St. Helena Cabernet sauvignon and Vinoland's Syrah.) As usual, Vinomaker had slightly underestimated how juicy the Syrah grapes were and so there was a bit of a scramble to find another container to transport the wine from the crush pad up to Vinoland's modest barrel chai. It was a busy day. But not before I had taken a quick jaunt up to Oakville to join my co-workers at TWWIAGE in celebrating the end of Harvest 2016. The vineyard crew at TWWIAGE had harvested the last grapes back on October 8th. (TWWIAGE's last tank of Cabernet Sauvignon was pressed off on October 17th and was commemorated with a sparkling wine toast.) Those vineyard lads definitely know how to throw a harvest party: it is by far my favourite celebration of the season. Actually, it will be my only harvest party this year, as I won't be able to make it to the other two that I have been invited to. I have other pressing engagements. Harvest 2016 is finished, yay! Vinoland's Cabernet sauvignon grapes, the ones I lovingly tended all summer long, are now just juice (well, skins and seeds too). The must is now awaiting inoculation with Vinomaker's yeast of choice. My job is done. Special thanks go out to the St. Helena Sots (both sets), the Barrow Lane Boozer, the Atlas Peak Alky and the Coombsville Carouser, all of whom got just as drenched as me whilst harvesting the grapes. Cheers, my dears! I spent most of today leaf pulling in the Cabernet sauvignon vines in preparation for harvest tomorrow. I got a good look at the fruit as I stripped the leaves away and I'm estimating the crop is a little lighter than last year. And the vines seem to be shutting down rather early. The leaf pulling was a very dusty activity, I was filthy by the time I had finished. The Napa Valley is expecting its first storm-series of the season tomorrow, perfectly timed to coincide with the Cabernet harvest. It will be a rather soggy harvest event, but at least I, and the grapes, will be clean at the end of it. Oh well, sigh. Vinomaker and I pressed off the Vichyssyrah today; it was a very small batch of wine, so it took no time at all. In fact, cleaning up after the whole pressing process always takes much longer than the actual squishing of the pomace. But Vinomaker is a dab hand when it comes to using a pressure washer and he usually gets it done rather quickly. 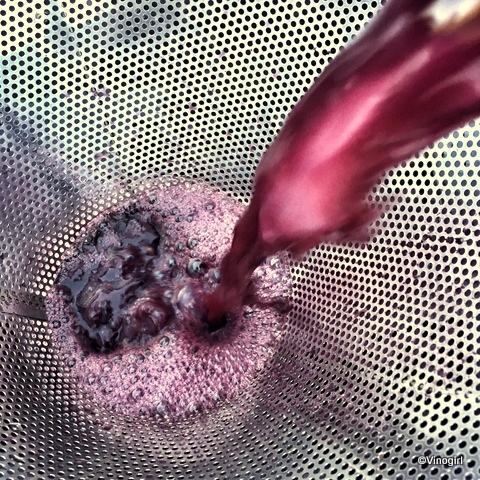 There are countless cleaning and sanitizing steps involved in every aspect of winemaking and there really are no shortcuts when it comes to cleanliness. As Bob Pepi, founder of Pepi Winery, once said, "Eighty percent of great winemaking is cleanliness." I'm of the opinion that the other 20% is spent just thinking about cleaning stuff. Vinoland's Syrah is picked, yay! Harvest was quick and painless and the fruit looks beautiful. The harvest party (Harvest Chili with jalapeno cornbread, then brownies and Neopolitan ice cream for dessert) was a lot of fun and included a great selection of wines. All of which were consumed down to the very last drop. One particular wine, that our merry little harvest group imbibed, was a Syrah made by a co-worker of mine (at TWWIAGE) from grapes from the 2014 harvest in Vinoland. I was gifted a bottle of the Syrah last Christmas. My co-worker and her boyfriend had bottled this wine when it was less than a year old. The main consideration for the early bottling was that they didn't have enough room at their house to live, for an extended period of time, with a barrel of maturing wine. And the brief barrel-aging was clearly apparent. The Syrah wasn't a bad wine, it was just nondescript. Of course, the entire bottle was consumed. I spent most of today pulling leaves in the Syrah vines in preparation for harvesting tomorrow. Stripping the leaves from the fruit zone makes the picking of the clusters much quicker, and easier. The yield looks average, but the quality of the crop looks great. I ate some grapes as I worked and they tasted lovely, so I am predicting that 2016 is going to be a nice vintage. Vinodog 2 accompanied me whilst I worked my way along the rows. Well, actually, she was busy harassing four deer in our neighbour's property who were staring her down. Then, tired with all that patrol-activity, she passed out on a comfy bed of leaves I had just removed from a vine. It's a dog's life. My little Vinodog 2 is 9 years old today. How did that happen? Time flies. V2 has had a rather rough year, so she thoroughly deserves to have a fuss made of her on her 9th birthday. People who know me know that I like dogs, but they really have no idea how much. I could not love V2 any more if I tried. I simply adore her, she's great. Just looking at her makes me happy. She's my funny, adorable little mongrel. I have to work today, but I'll make sure I take her for a good walk when I get home. Then I'll celebrate her big day with a glass of something bubbly.